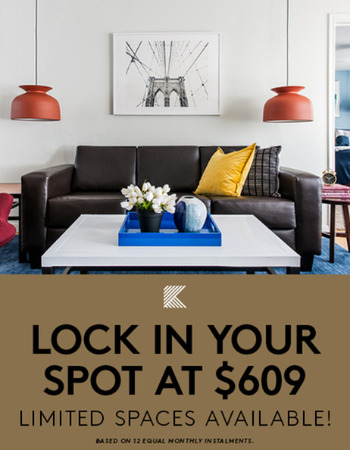 When you live at The Kristi you are not simply a resident — you become a member of a boutique student community that provides everything you need to study, socialize, relax, and live your best life. The Kristi is right in the heart of Corpus Christi. With a bus line directly to Texas A&M University-Corpus Christi, you’ll be sure to get to the classes you need on time. This property isn’t short on amenities either. We offer a resort-style swimming pool, 24-hour JIM fitness center and luxurious clubhouse with a fully equipped business center. Your rent also includes Cable TV and Internet and each unit comes with a washer & dryer and a spacious designer kitchen. There is so much more see at this amazing property. Take a look at our gallery or our amenities page to see and learn all we have to offer. Our welcoming 4-bedroom apartments offer all the comforts of home, including full-size kitchens, modern furnishings and private bathrooms. Our signature JOE Coffee Bar featuring Starbucks coffee and JIM Fitness Center with state-of-the-art cardio and weight machines give you everything you need to fuel your studies and stay in shape. We take a fresh approach to customer service. From maintenance to roommate matching, and everything in between, The Kristi staffÂ¬ is dedicated to creating only the best experiences for our residents.